Rameshwar Ghat: Rameshwar Ghat is located at a distance of 36kms from Pithoragarh on the confluence of the Ramganga and Saryu Rivers. There are two principal temples here dedicated to Lord Shiva and Lord Rama. A large fair is held here during Makar Sankranti because both the rivers play a vital in Pithoragarh district. Champawat: Champawat was the ancient capital of the Chand Dynasty. It is also believed to the place of Turtle incarnation (Kurmavatar) of Lord Vishnu. The place is rich in varied flora and fauna and also an ideal spot for bird watching. 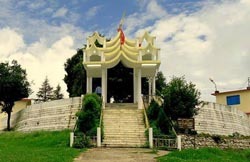 Champawat is surrounded by Nepal on the east and is covered by four districts of Kumaon region. Champawat is situated 72kms before Pithoragarh at an elevation of 1615mts above sea level.